So you can share the experience of having a tattoo-inspired accessory, here's a giveaway just for my readers! The giveaway is open to Philippines' residents only! ME ♥ Hi! It is great to be interviewing you! I would love to know more about you and the brand. 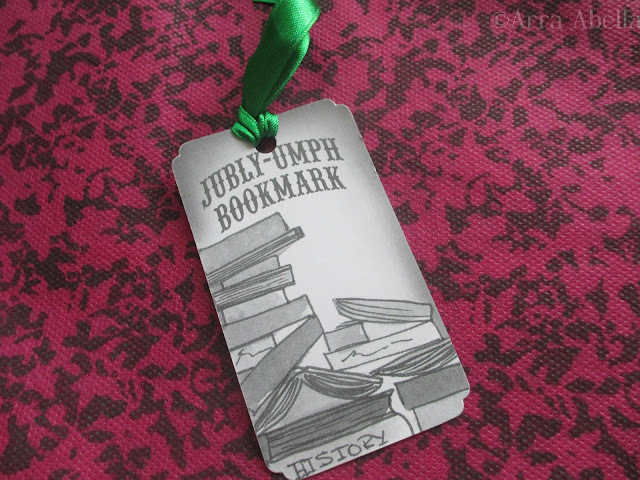 So first things first: what is Jubly-Umph all about? JUBLY-UMPH ♥ I am an artist based out of Melbourne, Australia who works in paper, watercolors ink and wood. 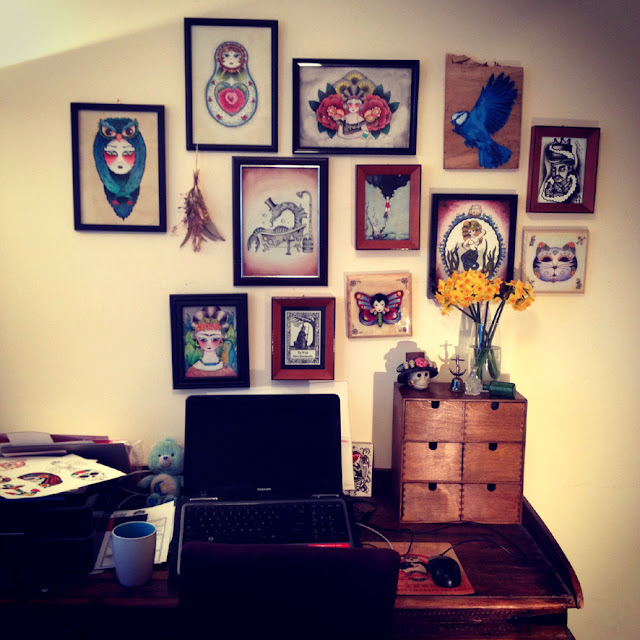 I love tattoos (although I have none), vintage ephemera and pin up girls and most of my art is based on these things. My partner and I then create jewelry, handbags, cards and prints out of my artwork under the brand Jubly-Umph Originals. 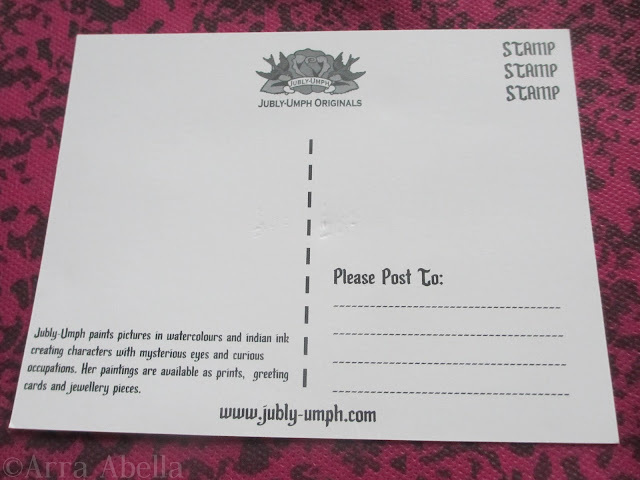 JUBLY-UMPH ♥ Our goals are to bring art to the masses and be able to support ourselves as artists full time. JUBLY-UMPH ♥ I started this business in 2009 when I first discovered a love of tattoo art but realized that I couldn't commit to a tattoo. 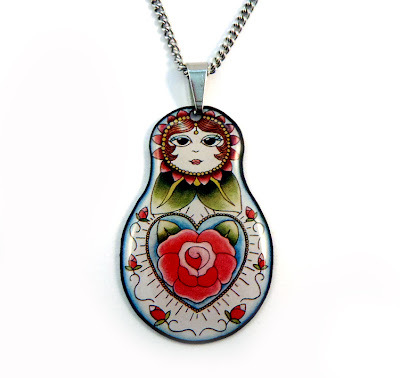 So the conclusion was to make tattoo style jewelry that could be changed everyday. JUBLY-UMPH ♥ I get up around 8 am and put on a pot of coffee. I love coffee. It is probably the most important thing in the morning for me. I then usually check emails and go through a list of things that needs to be done for the day. Each day is completely different, which I love, and can include anything from packaging orders, to painting or organizing new products. JUBLY-UMPH ♥ My studio is still a work in progress. It has two desks, many knickknacks, fresh flowers from the garden and a picture wall featuring some of my favorite paintings by myself and other artists. JUBLY-UMPH ♥ Jubly-Umph has many meanings and people are constantly coming along and telling me a new one. But the story is that the name is completely made up and nonsense, just like the artworks themselves. JUBLY-UMPH ♥ The products are unique because they are all made in small runs and feature artwork that you can’t get anywhere else. I am a small indie artist and this is a small indie company and for our customers wearing the jewelry can feel like you are in a secret club. 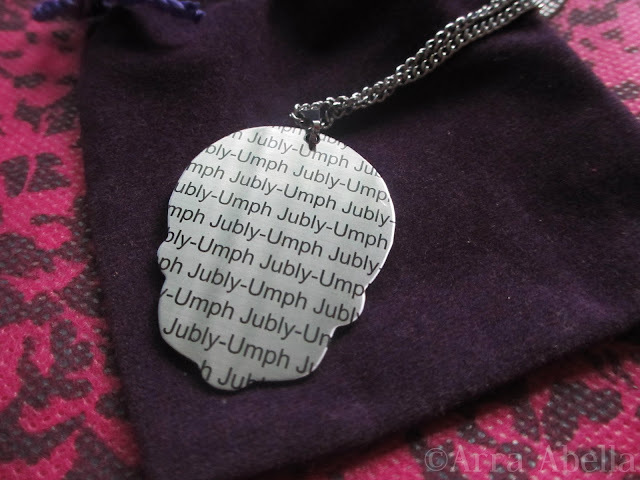 JUBLY-UMPH ♥ We have just released a new line of solid stainless steel and resin jewelry. This features 5 new Jubly designs such as an anchors, lucky horseshoes and mermaids. We are also about to release a range of handbags and wallets in the next few weeks. ME ♥ Do you have an actual shop that we can visit? If yes, where is it located? If not, do you plan on having one? JUBLY-UMPH ♥ I don’t have a physical shop just an online one (www.jubly-umph.com). I used to co-run a shop in Melbourne a few years ago but found it was too difficult trying to run two businesses as well as paint and I really just wanted to concentrate on one. I don’t think I would run a shop again. JUBLY-UMPH ♥ I have a blog here: http://jublyumph.blogspot.com.au which I write little articles on craft projects, fashion layouts and outings/events. 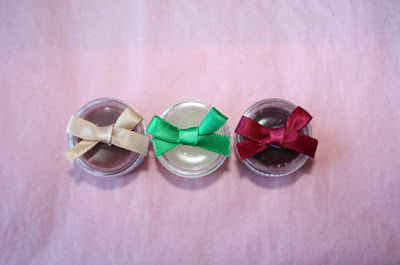 I like the craft projects the most and have a lot of fun making and then blogging about them. My next project is making a set of library style drawers from an ikea box. 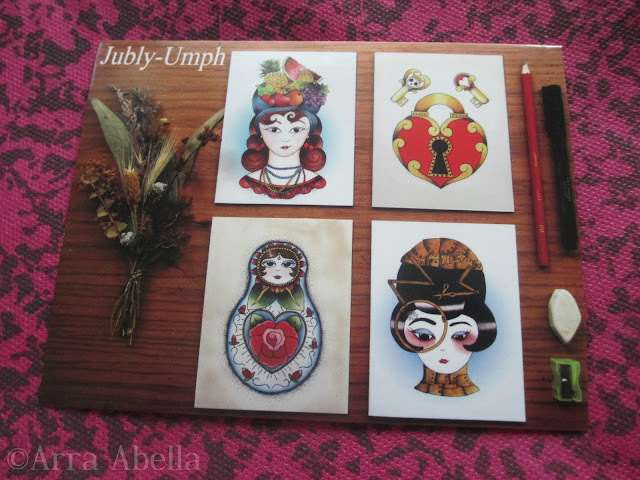 JUBLY-UMPH ♥ Vintage and indie. I have a lot of friends who are small independent fashion designers and I wear a lot of their clothes. I like wearing things that no one else has. JUBLY-UMPH ♥ Braids. I have a pinterest board dedicated to it and have been trying out new styles every day. JUBLY-UMPH ♥ This is my all time favorite and I wear it almost every day. ME ♥ The key piece here is Jubly-Umph's Bandit Queen necklace. So I created what I feel like can be a modern take on a bandit's outfit. The girl wearing this would definitely be a badass. JUBLY-UMPH ♥ This is probably the most tattoo like. Great worn with a low cut top. ME ♥ The key piece here is Jubly-Umph's Swallow & Lock necklace. So I incorporated the necklace's colors on the outfit. I also made sure that the necklace will stand out on the outfit. It has a summery feel and the colors are vibrant making the wearer a head-turner. JUBLY-UMPH ♥ These are great for everyday wear and go with many outfits. ME ♥ The key piece here is Jubly-Umph's Day of the Dead Kitty Cat studs. 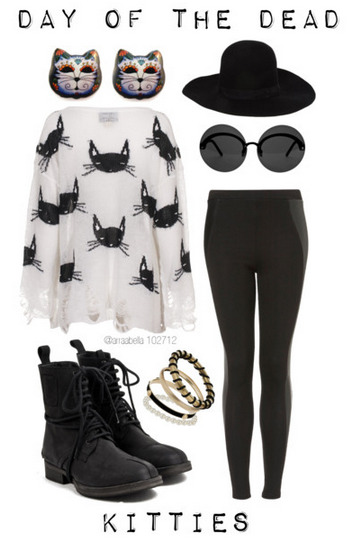 I searched for a cat-print sweater and stick with the very laid-back look for fall. Black and white will also add mystery to its wearer like how enigmatic the earrings' design is. ME ♥ The key piece here is Jubly-Umph's Rose Cardigan clips. When I saw this dress, I knew that the clips could work with it. I imagine a very sophisticated woman wearing this. 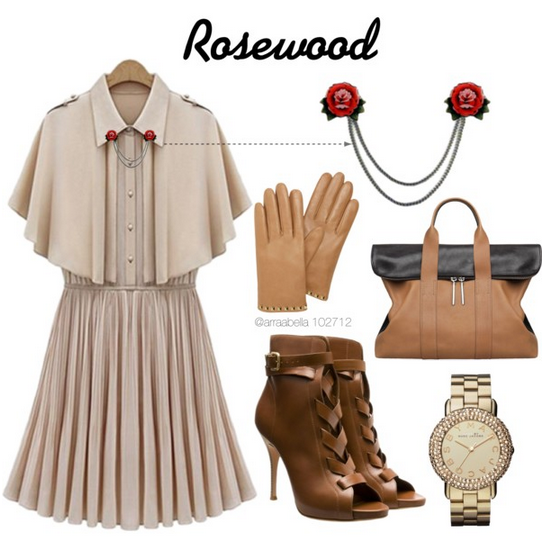 Because I am currently reading the Pretty Little Liars series, I can see Spencer Hastings with this outfit. It shows a smart, classy woman which Spencer's character exudes. ME ♥ The key piece here is Jubly-Umph's Ruby Birdhead necklace. According to Jubly-Umph goes well with red and black so I incorporated the colors with this look which made the necklace standout. ME ♥ Artists you look up to? JUBLY-UMPH ♥ I love modern artists like Mark Ryden, Angelique Houtkamp, Rose Hardy, Vali Myers as well as illustrators I grew up with such as Mervyn Peake, John Tenniel, Arthur Rackham, Chas Addams and Edward Gorey. JUBLY-UMPH ♥ Sunglasses, mascara, lipstick, pocket mirror, allan key, pens and notebook. JUBLY-UMPH ♥ I always have a pile of books by my bed. I just reread my favorite novel, The Shipping News, and have the Hunger Games ready to start. ME ♥ Some recent designs or drawings you can share to us. JUBLY-UMPH ♥ I have just finished 2 new paintings. 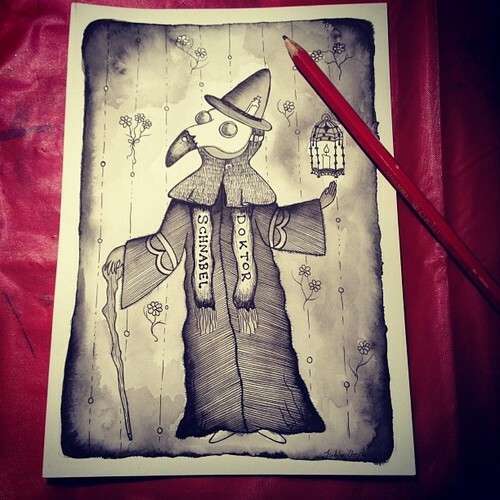 The first is called La Luna and the second is The Plague Doctor. An interesting title isn't it? Well, Jubly-Umph is actually a Melbourne based artist who paints pictures in watercolors and Indian ink creating characters with mysterious eyes and curious occupations. Her lovely lady heads are instantly recognizably and owning one is like being in a secret club. 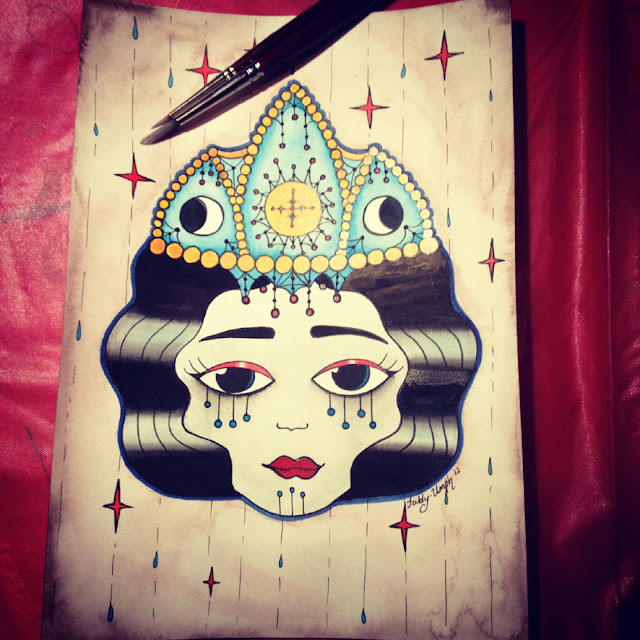 She is influenced by traditional tattoos, folk art and Victorian sentimental ephemera. Her paintings are available in limited edition giclee prints, eco-friendly greeting cards and resin coated jewelry pieces. Each piece is created from an original Jubly-Umph illustration and made from solid stainless steel coated in glossy resin. It is light weight and waterproof and comes with a stainless steel chain. The new designs feature beautiful floral anchors, lucky horseshoes and smiling sugar skulls all bright and cheery for spring. They sent me this set and I would say that I am really impressed with their creations. Truly their designs are one-of-a-kind and totally different. As you can see, all of their creations were branded by their name. It's definitely owning their art like when we put watermark with our photos. Actually, at first I thought that the steel pieces will be heavy but I realized otherwise when I was able to hold it. It was actually really thin and light. Also the designs are scratch-proof because of the glossy resin. The package included a postcard with their designs and also their calling cards. I actually like how it was all personalized. Ever since I think it is more sentimental when they include such in the package. 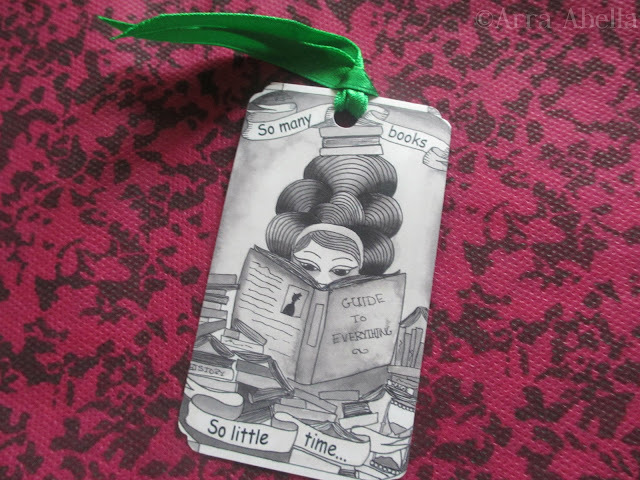 What really touched my heart is that, the artist know that I am a bookworm that she also included a personalized bookmark. I see myself as the reader in the picture with that curly hair and also drowning with books around me. "So many books, so little time," which I often say when I am so swamp with books that I want to finish them every single day just to make time. Thank you, Jubly-Umph for these wonderful pieces! Watch out for my interview with the person behind Jubly-Umph tomorrow and also a little something for you, my dear readers. I want to be a princess. I am a princess. I remember I bought this book (I think) when I was in grade 6 or maybe when I was in my first year of high school. I was fascinated by stories about princesses and all that royal stuff. I wished that I was a princess because I feel like it is fun to wear those big dresses all the time and to live in a castle. And this book satisfied my fantasy as an aspiring princess (LOL). Can I just say that I love Meg Cabot? Anyway, I really love reading this book because it has a natural feel in it. It is a reality. 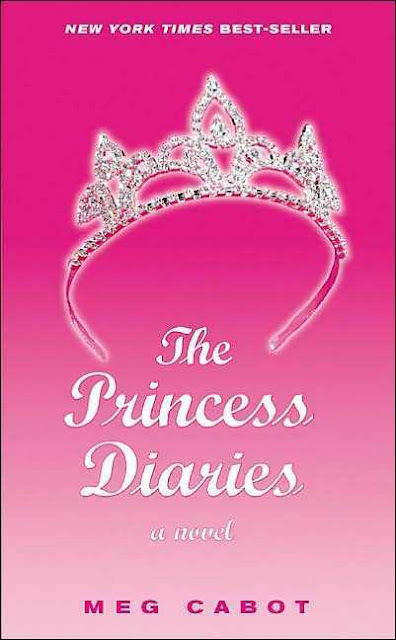 We, teens (or young adults as I wrote this review when I was still a teen), can relate to this because of the typical rants we have in our lives especially what we have to deal with during high school though being a princess is unusual. I also love how it was formatted as journal entries rather than the typical narration. The diary actually mirrors experiences we have undergone. The book's humor also added a jolt of fun which I really appreciate. It was really inspiring. It will give the readers new philosophies or perspectives in life. It will give you the strength to actually face our fear of dying or the thought of death. We always see death as a negative thing. 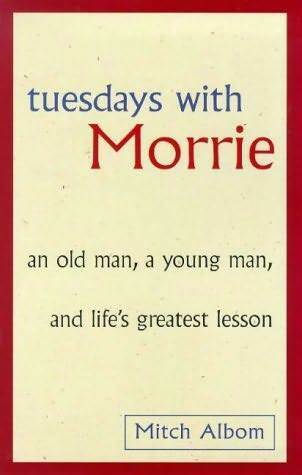 But after you read this book, Morrie will make you realize that it can also turn out to be the opposite. I guess I agree with Morrie. I remember my late grandmother again. She didn't need material things to make her feel better and special. All she needed was her family and friends. The love and care we showed her until her last breath. That was one of the things Morrie is pointing out to Mitch that power and money doesn't matter when you are dying. What will matter in the end is the people; the love and care you will receive from the people around you. Question: I have no idea how to wear this floral denim jacket. 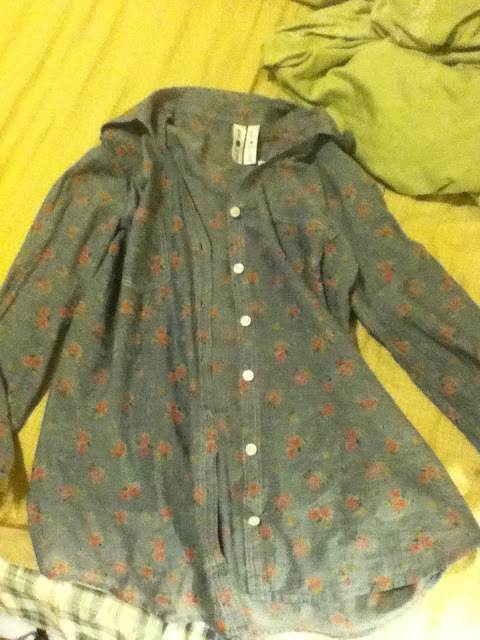 Hopefully the image will work, but it's a blue-gray color with pink flowers on it. I'm not sure what to call it... It's a little thin to be a jacket, a little casual to be a blazer, so I don't know haha :z But yeah, any tips on how I should wear this? 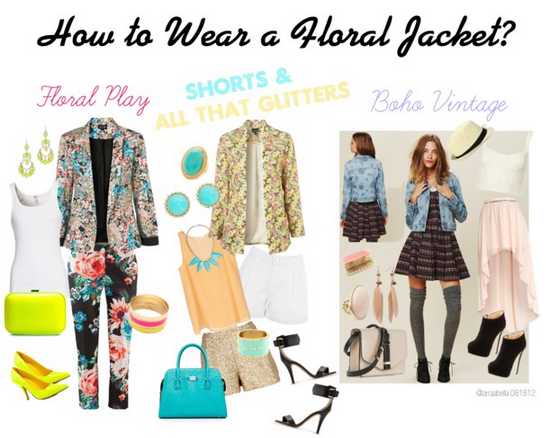 I know that you are only asking how to style a floral denim jacket. But I actually realized the denim when I finished creating the set. Oh well, I think it will show the variety of floral outerwear and how we can style it. Suit up with a same print blazer and pants. In my case, I wasn't able to find the same piece so just use the similar details or put a contrast, like I did. To be more striking, add neon pieces to the look. Blazers and put on jackets can be paired with shorts and skirts. I chose these hues for the summer feel and for a mellow tone in contrast to the full on floral. Also perfect for cover ups. As I was researching for the floral denim jacket, I saw this photo from Free People which says it all. A vintage school girl look which is what I am actually aiming for. Just to be a little bit more creative I added an alternative which is a favorite of mine. The lace, high low skit, denim combo is a favorite of mine. Plus the denim is floral so it added an extra sweet touch to the look. Still very feminine and layered. I know the title is the irony of the given hue. Pink is a very common color especially to us girls. Hello Mean Girls, Pretty in Pink and Legally Blonde. We just can't resist how lovely the color is and how it stands out especially the darker shade. I would always pick the darker one rather than the opposite. And with that, I want to end the challenge with a message to everyone: We are born to stand out. With all those light pinks out there, we can shine more in a darker and live color. To my friends, Marion of marionquitasol.wordpress.com and Mia of http://teenagebeautyblog.blogspot.co.uk/ who participated in the challenge, thank you for contributing. For those who have read our interpretations, thank you for reading them. I hope you enjoyed viewing our sets. I hope more can join and participate in the future! Style Advice: What to Wear with Vans? 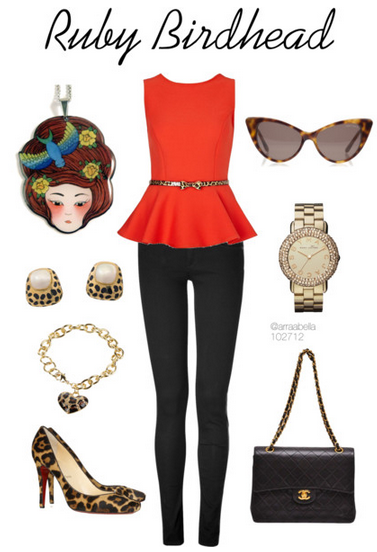 Here's another category of my blog where I answer outfit queries through Polyvore. Question: What to wear with vans. I don't want to look tomboy, I know i can wear anything but i'm running out of ideas! Oh I just saw Kristen Stewart wearing them! is there another way to wear them? thaaaaanks! We actually thought we cannot wear sneakers with very sweet and lovely dresses. But that is wrong because we can by wearing tights or knee high socks that has girly designs, patterns or details. I chose these socks because of the cute ribbons. I specifically chose a collared dress and not the usual ones because it is very feminine. With the hair I'm thinking of this hat which exudes a retro look or you can wear this flower head piece like a fairy. It adds a sweet touch to the look. To still keep things feminine, add pearl accessories. t is just simple and chic in a simple way. Plus the brown vintage style bag to stop the monotone and to add some color. 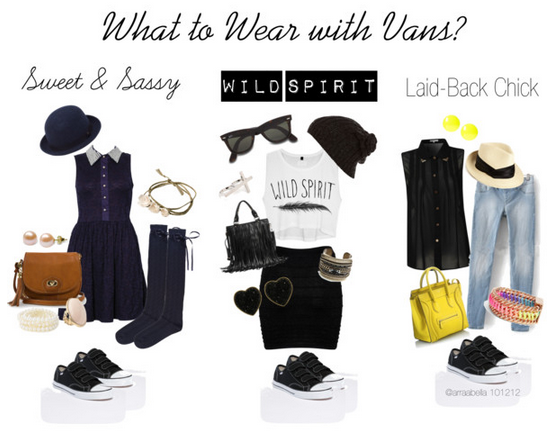 Unleash the rocker or rebel child in you by combining a black and white outfit, fringes and studs for details. To still keep the girly vibe, a hanging top and a skirt will do! Very Miley Cyrus or even Kirsten Stewart. Still feeling the summer vibe? Add some neon colors to your look. Though you are wearing pants, again, I chose a black sheer top with collar details for the feminine touch. I also advice to fold the ends of the pants. Hope to see you wearing one of these! 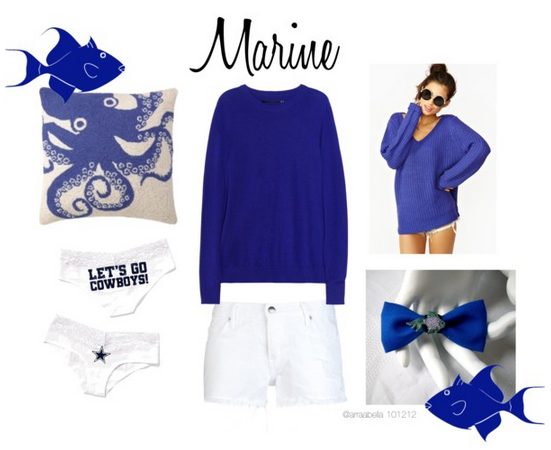 When I saw the word, 'fish,' I knew that blue should be the main color of this set. The color reminds me of water and of course, the marine life. I also made sure that this set will be perfect for the beach. The look of the model is also perfect for a laid-back style. Blue is just a relaxing color. There is something in this hue that pulls me in whenever I look at it. Same when I saw a beach. It makes me want to just dive and feel the waves. What's your interpretation of Chapter 22? Remember on my Love Lila giveaway, I asked you guys to hit me up some questions? Well I'll be posting it now. I am so sorry for the delay. I actually have very sensitive skin as well. I am not really a make-up genius because I am actually starting to learn. When I attended the Majolica Majorca Psychedelicious event (which I haven't posted yet, backlog at its finest), I learn that for us with that type of skin, we should use non-comedogenic products. According to wisegeek.com, non-comedogenic is a term applied to oils, lotions, and skin creams that do not block pores. Non-comedogenic products are also sometimes referred to as non-occlusive. The theory behind using lotions that are non-comedogenic is that by not blocking pores, they will reduce the incidence of pimples. 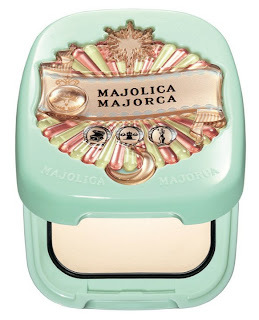 I like Majolica Majorca's Pressed Pore Cover 2011. I actually tried it before in the makeover session we had in the event. I wore it the whole day because there was an emergency in my family so we had to stay in the hospital for quite a long time. I felt the need to re-touch and actually the oil during the evening. But throughout the day, my face do not feel heavy and not oily at all. Plus I did not have breakouts after that. I sometimes wear some cheek tint. For you, I'll recommend this one because like I said, their products are non-comodogenic and the puffs are actually better than the brush. It does not irritate the skin which avoids skin breakouts. I use this for my eyebrows which I lack and eyelashes. Because I changed my hair color to brown, which is also starting to fade, brown eyebrows will compliment my hair. I know that Indians have very dark and long lashes, so I think what you can use Majolica Majorca's Lash King to make it darker and longer for that very mysterious effect. With the eyes, if you want something simple and plain just put a liquid eyeliner on it. If you want a little color you can use Majolica Majorca's Jeweling Eyes. Stick with neutral tones, though. With the lips, I usually use my Two Crafty Unicorns lip balm in vanilla tint then I will apply my Nyx lipstick (Doll/Paris/Louisiana/Snow White) or MAC's Viva La Glam. Hmm. I actually can't think of any color that I haven't worn yet. I love experimenting and trying out if it suits me. Also with clothing. But you made me think, so I'll have to ponder about this really well and I'll get back to you. There are six palettes that would love to wear for fall if given the chance (living in a tropical country; but will do when it starts to be less sunny here). Red. Black. Brown. Wine. Gold. Cream. These for me exude elegance and class, whether you'll be wearing a casual or formal outfit. The colors attention but not too striking. All of it could compliment the gloomy and cold season. I actually had two. I always knock on wood whenever I said something or think of a scenario that I will not like to happen or if I feel that would be unlucky. I also cross my fingers whenever I want something to happen and vice-versa. In our country, there are a lot of superstitions that we do not want to believe in but we sometimes can not ignore. Also when it comes to the meaning of dreams. Like when a glass breaks it means someone close to you might be in danger or when you dreamt of losing a tooth or your teeth or if it falls off, it also means death. There are actually A LOT. But the first two I mentioned are the ones I actually do in a daily basis, sometimes it is turning into a habit. 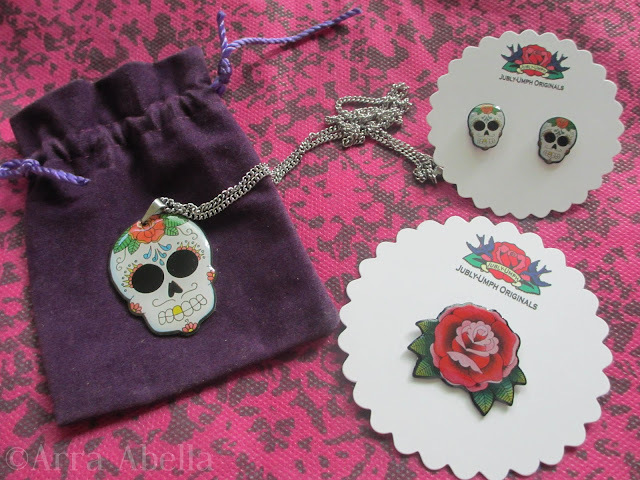 I know you were referring to my Love Lila giveaway last time! Thank you for joining and watch out for more giveaways soon! I also do visit shops in Facebook and Etsy. Sometimes newsletters from shops help because it can make you see their new arrivals or their current promos. As cliche as it may seem, I think yellow is always the color that will symbolize happiness. The vibrant hue just makes you want to smile. It reminds us of sunshine. Thank you for the questions! I enjoy answering them and sharing things about me. I also appreciate and feel flattered when you ask my advice.